Hello, my lovelies! Today, I've written about something a little bit different from my normal nail posts. Back in September, a little sign went up in a previously-vacant window next door to my regular Starbucks, which is across the street from my school. It read: Coming Soon... Drybar. My curiosity was piqued, so I headed to the Google and received a pleasant surprise! As it turns out, there are 26 Drybar locations in existence, with a 27th scheduled to open this year. They are located in Arizona, California, Georgia, New York, and Washington, DC. What is Drybar all about? Blow outs! It is literally a "blow dry bar," where you can go to get a blow out and style for just $40. No extra charge for curls or thicker hair (I'm guilty of both). No extra charge for a wash (which is included). A flat $40. In and out in 35 minutes. I'll admit that I was skeptical. I have notoriously curly, thick, and frizzy hair. Past stylists have told me that my hair is so difficult, they like to use the new salon products on me as their guinea pig to see if the product's claims are true. That's my hair. So you understand why I didn't think I could just get assigned a random stylist who could tame my hair and give me long-staying curls. It's a tall order, I'll confess. I didn't get to take a picture when I walked in (it was rainy and I was soaked! ), but this is exactly what it looks like! I love the stark white with yellow accents and ornate frames and mirrors. It was bright and welcoming. There was music pumping through the speakers and there was a pleasant sort of bustling going on. The music was kind of loud for me and as a woman of twenty-two who blares her music and cranks her guitar amp to 11, that's saying something. It probably would not have bothered me as much at 4pm as it did at my 10am appointment. I had just gotten my coffee, after all. Immediately after entering, I was greeted at the front desk and checked in for my appointment. I was a bit early because I was so excited and was told to take a seat. My stylist would only be a few minutes. Yes, they were playing Mean Girls when I walked in! Sure enough, five minutes later, Katie F. appeared and made me feel like I was meeting up with an old friend, rather than a hairstylist! The receptionist took my coat, scarf, and bag (remember, this is NYC in winter, my friends) and asked if I wanted anything to drink. I opted for water, which had pieces of fruit stepped in it. DELICIOUS spa water! Katie brought me to her station and asked what kind of style I was looking for. Once I told her I wanted curls, she gave me a small booklet with sample curly styles to pick from. I wound up going with the Cosmopolitan. Here's a list of the styles they offer! See? I wasn't lying about the $40! After a wash, I went back to Katie's station. As you can see, there are flat screens mounted around the salon, showing chick flicks. The movie being shown while I was there (and distracting me from my Property reading) was Clueless. I hadn't seen this movie since I was fourteen, so you can imagine how hard I was laughing. This made me laugh... but it was super convenient! It's a foot bar in front of the chair! 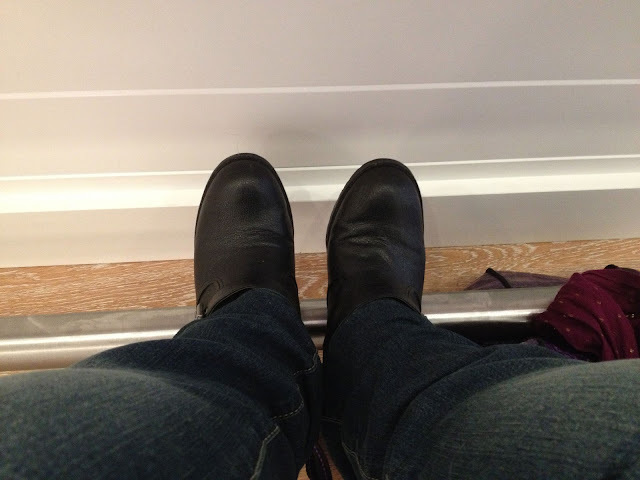 I'm one of those short people who can never find a place to put my feet because the ones attached to the chairs are uncomfortable. So I adored this little touch. 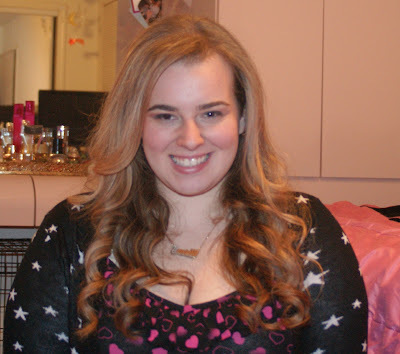 My hair is notoriously difficult, as I mentioned at the beginning of this post. So it didn't surprise me when my appointment ran ten minutes over. Did I get charged for the extra time? Nope. Because this place is awesome. Well, first... I need to show you a picture of my hair normally. Excuse the slight graininess of the picture. 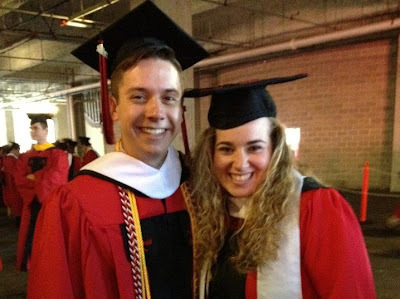 This is a shot of my friend (and fellow suffering law student) Mike and me at our graduation from Rutgers University last May. And yes, I am wearing a super jeweled mortar board. It took me six hours. Ta da! I know... awesome, right? And this picture was taken at 5:30pm because I couldn't get a good self-portrait at any other time during the day. It looks exactly how it did when I walked out of the salon. And I walked right on into class, strutting like Gisele on the catwalk. Overall, I'd highly recommend Drybar to anyone and everyone. It was $40 well spent and I have gone back a second time since. I'm also getting ready to book another appointment next week in preparation for my Maroon 5 concert. It's Adam Levine. I mean, come on. I have to. Plus, they're running a promotion from 2/13-2/15 that you receive a free bottle of product (valued between $20 and $25) with any service. Win-win! 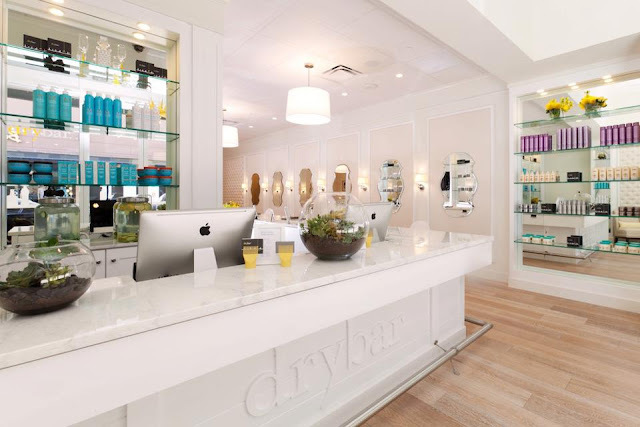 For more information on Drybar, or to find a location near you, check out their website. I visited their TriBeCa location on West Broadway, between Church and Worth St. I have only used Katie F., and plan on using her for appointment #3, so if you're looking for a stylist there, I highly recommend her. But all of the other stylists were doing awesome jobs on the other ladies who were in there with me. So are you as sold on Drybar as I am? Have you visited one of their locations? Let me know! 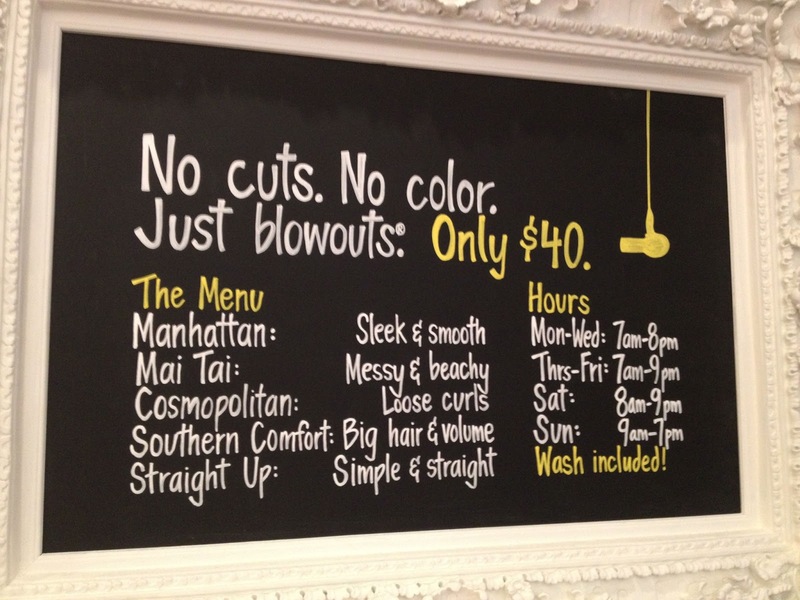 as someone who has worked in the salon/beauty industry for over 15 years i can honestly say this is a genius concept. love the style of the salon and the choice of movies they're showing, too!